Makes you work a lot for very little. The repetitive churn of missions and activities further spoil an only occasionally entertaining shooter. Firefall is a free-to-play MMO shooter with an emphasis on dynamic events, skill-based combat and desperate defences against sometimes overwhelming enemy forces. All of which sounds promising, but Firefall also features a lack of variety, constant busywork and a set of interconnected systems that sit awkwardly against the moment-to-moment drudgery of the game. It has potential. The problem is that, in almost every instance, it fails to meet the ideal it's trying to sell. The single greatest example of this—at least across the thirty hours that I've played—is found in Sunken Harbor. It's a hub containing a PvP arena, designed as a space for players to let off steam between missions and activities. Only, where the in-game displays and banners advertise a fully featured team competition, the reality is an unstructured free-for-all, where the few who show up take pot-shots at each other before growing bored and wandering off. Mostly it sits empty; a symbolic beacon of Firefall's lengthy and troubled development. That's a shame, because, in the right place, with the right class and when participating in the right event, you get a hint of what the game should have been. There's a frantic fun to be had dodging and weaving with your jetpack, avoiding fire and clearing out hordes. 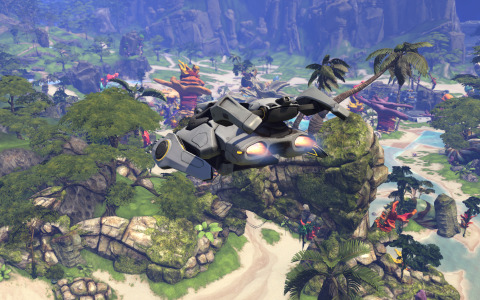 Firefall contains the suggestion of a solid shooter, and occasionally it comes to the surface. Set primarily in Brazil, Firefall depicts a world that's witnessed more than its share of cataclysm. First there was the Firefall itself: an asteroid shower that devastated much of the planet. More relevant to the main plot is the Arclight, an interstellar spaceship that crashed into Earth on its maiden voyage. Its flaring crystite engines pulled through a strange purple death cloud from an alternate dimension. This is the Melding, from which emerged the Chosen—the rather self-defeating name given to the humanoid beings now trying to wipe out humanity. This is the backdrop against which you, the gun-for-hire Ares 35, operate. As a mercenary, the invasion of the Chosen is, at first, only tangentially related to your operations. The war provides plenty of opportunities to pick up work, and so the majority of your time will be spent taking on missions from each hub's job board. These offer a variety of scenarios in which you must go to a place and kill some things. Sometimes you're killing things while defending a person, sometimes you're killing things while collecting some items, and sometimes you're killing things because those things needed killing. Each job is accompanied by dialogue between your handler, Aero, and your temporary employer. Some form multi-part quest chains that span multiple hubs. At each new area, I made sure to pick up any missions involving a rogue named Wiley, who'd previously had dealings with my callsign's last owner. It was a fun little mystery sprinkled sparsely throughout my time with the game. But aside from this, and a few other notable exceptions, the game's conversations waver between incidental and annoying. Aero, in particular, has a jarringly moralistic edge. She'll repeatedly tell NPCs you're not a contract killer, which, given all the killing you do, rings somewhat false. From its opening moments, through to its sparse end game (currently a dedicated PvP zone and couple of raid bosses), Firefall is an awkward mix of shooter and MMO. It doesn't have the breadth of systems needed to keep levelling entertaining. As such, the game devolves into repetition. Many objectives struggle to sustain the pretense of variety across even a single mission. Too many times, I would take down the requisite number of bandits, only for that counter to increase as a new wave spawned. The few times a mission does try something different, it can go badly wrong. In one job, I was required to disguise as a bandit. This happened without warning after completing a combat objective, leaving me close to death and without my abilities, jetpack or health regeneration. Even after I'd inevitably died, I respawned at the quest hub with the disguise still intact—forced to sprint back to the objective without access to my deployable vehicle. A potentially interesting mission became memorable only for its failings. When you're not on a job, you'll be stopping at one of the dynamic events that appear across the map. These range from small, solo missions, to more difficult group activities. There's little to distinguish these from the regular quests—you're still travelling to an area of the map to fend off bugs, bandits or Chosen. But many require you to hold out against waves of enemies, and it's this structure that provides the best showcase for Firefall's combat. At the start, each player has access to five basic battleframes. These lightweight mech suits act as your class, and can be swapped at any Battleframe Station without changing character. Earned XP goes towards levelling your currently equipped frame, so while experimentation is possible, it's more effective to stick with a single type. The battleframe you equip defines your weapons and abilities, and—while all are useful in combat—some have the edge in terms of how enjoyable they are to play. In particular, the minigun of the Dreadnaught and the scoped automatic rifle of the Recon are unexciting to wield. In typical MMO style, enemies can have a big chunk of health. Holding the mouse button over one as their HP slowly drains is an uninteresting interaction. I grew more attached to the plasma grenades of Assault class's cannon, which required me to be consistently accurate while on the move. It doesn't match the satisfying skill level required by Tribes: Ascend's Thumper DX or Spinfusor, but at least offered a challenge that dragged me through the game's repetition. Each frame can equip abilities to the first four slots of the hotbar, and it's these that gel so well with the defensive mission architype. Engineers can place turrets, Biotech's can deploy healing area-of-effect spells, and Assaults can slam to the ground, doing huge damage to the collected enemies below. The best example of this is squad "Thumps". These are resource collection events, and can be called down by players to any location. Personal thumpers offer a challenge, but it's the craftable squad versions that provide some of the game's most tense and engrossing battles. If this is starting to sound like unqualified praise, know that the event system is completely unsupported by the way players travel across the map. Melding Tornadoes are one of the other most interesting activities the game offers—a group battle against a swirling, purple, Chosen-spawning twister. It's a call to arms for the playerbase, with the coordinates shared over zone chat whenever one appears. Except, even knowing where it is, it can difficult to reach. You can teleport to mission hubs, but doing so costs Credits—a valuable currency that I was never comfortable wasting. At which point, you're forced to either walk or drive, the latter only an option if you've bought a vehicle with real money or crafted one following a level 25 mission. Most of the tornadoes had disappeared by the time I'd arrived. That or they were empty, leaving me with no hope of finishing the encounter. This is Firefall's other major failing: it doesn't respect your time. Yes, it's a nice looking game—the alien vibrancy and variety making up for some inconsistent texture quality and off-puttingly cartoonish NPCs—but these scenic views don't justify the how long you'll spend sprinting from location to location. In one early mission, I was asked to trek north to meet with a character. When I arrived, they asked me to turn around and head back. It's an almost comically egregious example, but it highlights a persistent flaw. The real money store is largely stocked with cosmetics and XP boosts. It's not "pay to win"—a meaningless designation in a predominantly PvE game—but it is skewed so that the non-paying options take more time than they're worth. Crystite, the basic in-game currency, is earned slowly, and is largely swallowed up by researching new crafting options. This in itself is a slow process—all crafting actions are performed on a timer that can take anything from seconds to days. That timer, of course, can be bypassed by paying real money. These are all small inconveniences, but they add up. Yes, free-to-play games must strike a balance between time and money, but here that balance feels off. Not because of the contents of the store, or the value of each currency, but because Firefall is rarely engaging enough to make the commitment worthwhile.